Yes, that’s a duck’s beak. We’d been talking about how great it would be to get a whole duck and roast it. Our friend Jeff has recently taken up duck hunting, but hasn’t had much luck so far. We heard that there might be a duck purveyor at the Mueller Farmer’s Market, so we went there one Sunday morning. We grabbed some coffee and cash and spent a good hour browsing the stalls; they have so much good stuff! After fearing we’d have to settle for an eight dollar jar of duck fat, we finally noticed that the Countryside Farm stand was selling duck in addition to chicken, eggs, and charcuterie. Sebastien Bonneu sells whole ducks (complete with their heads, as above), breasts, and legs. We pondered the options for about ten seconds before putting our money down on a whole duck. It was $42.00 and weighed nearly seven pounds. Keep in mind as you read on that duck fat usually runs about a dollar an ounce, and duck broth goes for about three dollars per ounce! If your duck is frozen, let it thaw out overnight (or up to 24 hours, depending on its size) in a refrigerator, in its original wrapping. When it’s fully thawed, preheat your oven to 325°. If necessary, gut the duck. After much hand-wringing and YouTube-video-watching, we finally stuck a hand in our duck and realized that it had been gutted, its guts stored neatly in plastic bags inside the cavity. We took those out and set them aside for later (duck pâté, anyone?). Rinse the duck and pat dry with paper towels. Slice off any excess fat (with special attention to the duck’s hind quarters). Set aside for later. Grease a large roasting pan (we used olive oil). Place the duck in the roasting pan, breast up. Stuff the duck with the spices or other foodstuffs of your choice. We used lemon, orange, roughly chopped garlic, and sprigs of homegrown rosemary and thyme, tied with twine. Do not overstuff your bird, like a Thanksgiving turkey. You want air to get in and around the seasonings for even cooking. Truss the duck with twine. Grab both legs, pull tight, crossing one over the other, and tie. This will still leave an opening to the cavity, which is what you want, as previously discussed. You can also tie the wings, if desired; I left the wings and head as they were. A note about the head: You can remove the head before cooking, if desired. There’s not much use for it, as it has little meat (aside from the brain and tongue), and, if used in a stock, will impart a slightly metallic taste (or so I hear). We decided to leave the head on, Chinese style. Score the skin diagonally as below—just through the skin, not into the flesh. Then use the tip of your knife to poke a few tiny holes in the skin, like you would a potato! This will allow the bird to release more fat, making for a crispier skin. Add a light glaze of olive oil to the skin using a medium pastry brush, and roast the duck in the oven for an hour. Remove the pan, and turn the duck over so that it’s breast-side-down. Baste the underside in the juices from the pan, and roast for another hour. Remove the pan again, turning back over so it’s breast up, as it to serve. Your duck will now be getting nice and crispy. Remove most of the liquid fat from the pan and set aside. Glaze the duck. We used a mixture of orange glaze: the juice and zest of one orange and one lemon, 2 tablespoons of raw honey, salt, and pepper. Again, baste in any remaining pan juices. Return the pan to the oven and cook for another 30-60 minutes, depending on bird size. After a total cooking time of two and a half hours, check the internal temperature periodically using a meat thermometer. The duck is fully cooked and ready to eat when it reaches an internal temperature of 165°. This will probably take at least three hours. 3. Render your own duck fat. While your duck is roasting, you can make your own duck fat! First, strain the liquid fat from the pan. We strained the fat into a wide mouth Mason jar, using cheesecloth to separate the fat and crispy pieces from the liquid. If your fat is still a little cloudy, feel free to strain it again. Leave the resulting liquid fat uncovered while you render the rest of the fat from the bird. Take the solid pieces of fat you sliced off the duck earlier and chop them up into smallish pieces. Place these in a pan with a little water—enough to entirely submerge the fat. Simmer over medium low heat until the liquid is a nice golden color. 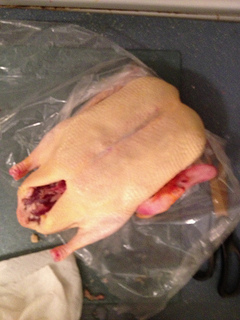 Time will depend on how much fat you have, but it took me about 30 minutes to render the fat from our seven pound duck. Watch the fat boiling, and note the color. It will get darker, and the simmering bubbles will get much smaller as the water escapes the pan. Be careful not to burn it—this stuff is premium. Our bird resulted in about a cup and a half of rendered fat! Follow the same process from earlier, straining the fat through cheesecloth, allowing it to cool for at least a half hour, then seal and place in the refrigerator. Now you have delicious duck fat, which can be used for any high temperature frying for which you’d use bacon fat or schmaltz (like my Schmaltz Roasted Potatoes with Crunchy Sage). It should keep for a few months in the fridge, or up to a year in the freezer (however, you’ll eat it way before you get to that point!). When you’ve determined that the duck is done—golden brown and crispy on the outside, 165° and juicy on the inside—, remove it from the oven and turn off the heat. Allow the duck to sit for about ten minutes. Carve the duck as you would chicken or turkey. Everyone wants the succulent breast pieces first, and I don’t blame them! If using a sauce, drizzle it over your duck (I whipped up a quick, thin sauce using additional orange juice and honey, plus a little tamari), and serve immediately. Shred any leftover meat and save for later. We ate duck salad, duck with collards, and duck scrambles for a couple of days before freezing the remainder. Freshly roasted duck breast, with crispy skin. Delicious. 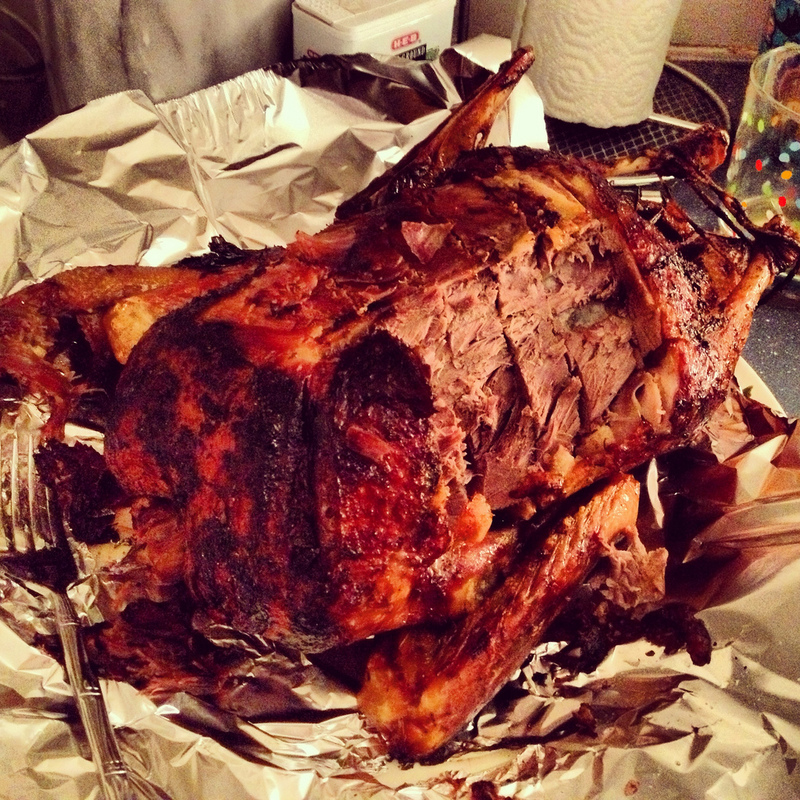 Using a large butcher knife, chop up all the bones and any meat leftover from your duck carcass. Chop into medium to small pieces, to release as much flavor as possible. Place all of this in a large stock pot, along with any vegetables or vegetable scraps (I used a mirepoix put together specifically for this purpose, purchased from Johnson’s Backyard Garden the very same morning I picked up the duck). Add a sprig of herbs (I again used homegrown, fresh thyme and rosemary, tied with twine). Cover with water and bring just to a boil, then immediatey reduce heat to a simmer. Simmer, uncovered, for three to four hours. Skim off any soapy residue as it rises to the top. After three to four hours (your kitchen will smell amazing by this point), you’re ready to strain. Start by removing all the large pieces of bone and veg with a large slotted spoon. Set aside. Once all the large pieces have been removed, it’s time to strain. I put a large plastic strainer in an even larger plastic mixing bowl, then lined the strainer with cheesecloth. I then poured the broth through the strainer. If you have a proper sieve, even better! Use that, pouring the strained broth into another bowl. As with the fat, strain multiple times if necessary. If the cloth becomes clogged with duck debris, rinse it and reuse. If you want an even more concentrated broth, pour this first broth into a new pot and simmer down to desired strength. Note: I did not add salt or pepper to this broth, so that the result would be neutral and useful for a variety of purposes. Salt can be added to taste in cooking. Pour the broth into a sealed container (or containers, as at left—we ended up with more than ten cups of broth!). It will keep in the refrigerator for up to two weeks. Or you can freeze it (as I did); it should last for at least six months, maybe up to a year. Finally, use the boiled-down bits of carcass as a fertilizer for your garden! And that is how you make the most of a duck. I’d say it’s well worth the $42.00 and time, wouldn’t you? This entry was posted in Austin, Essays, Family, Gluten Free, Locavore, Low Carb, Mains, Meat, Poultry by Susan. Bookmark the permalink. Jeezus motherfucke!!!! Thatte shitte looks fucken AWESOME!!!!!!!!!!!!! !